AMERICAN FORK – After taking down four-time defending state champion Lone Peak Friday night, it was probably to be expected for the American Fork High boys basketball team to have a bit of a letdown Tuesday night. The Cavemen were sluggish from the outset, and the presence of Herriman and its leading scorer, David Maynard on the opposing bench was a bad matchup for that kind of effort. The 6-foot-4 senior came out of the gate on fire, and while American Fork scored just 16 points in the first half, Maynard contributed 15 himself to the Mustangs 33-16 intermission advantage. The Cavemen made a bit of run in the third, opening the quarter on a 6-0 run, but it just wasn’t there on this night for the home team. In front of a small crowd, particularly compared to the huge turnout for that Friday night showcase at BYU’s Marriott Center, American Fork was flat and dropped this one by a 68-48 final count. 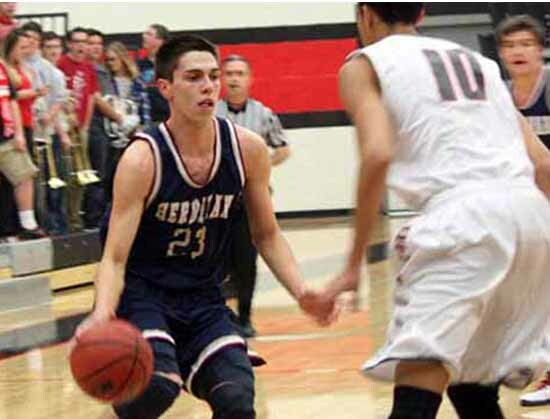 It was a huge win for Herriman, which was looking to avoid falling to 1-3 in Region 4 play, and it brought the Cavemen back to the pack a little, as it was the first league loss for them. With nothing falling for American Fork, the Mustangs came out moving the ball with purpose and created open shots all over the floor. Maynard was the primary beneficiary all night long, as he hit a pair of 3-pointers in that opening half while leading his team to the large lead. The contest began with the Mustangs opening up a 16-2 lead and it really never got much better for the Cavemen. 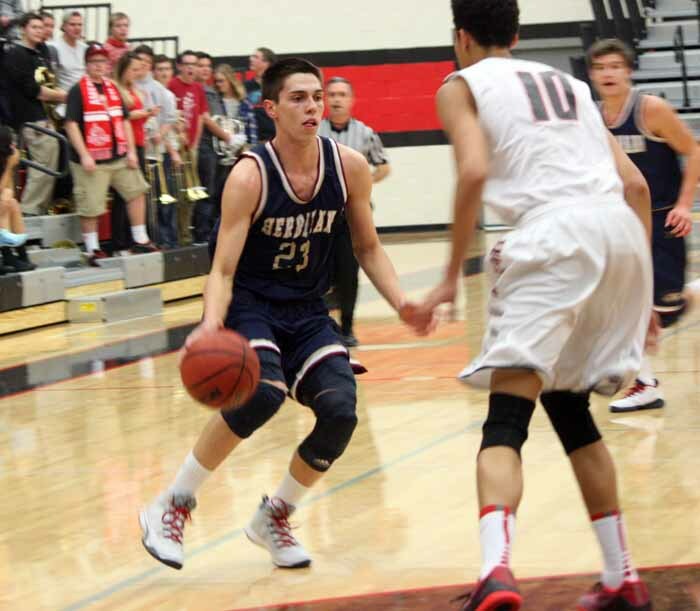 For Maynard and Herriman, the second half was more of the same – half-court execution, strong defense and outstanding rebounding all mixed with its ability to score in transition. Spencer Johnson managed to score 21 points for American Fork (3-1 in Region 4, 9-5 overall), with 16 of those coming after halftime, but he never really recovered from spending half of the initial stanza on the bench in foul trouble. Dallin Harley scored 12 of his 16 after the break as well. 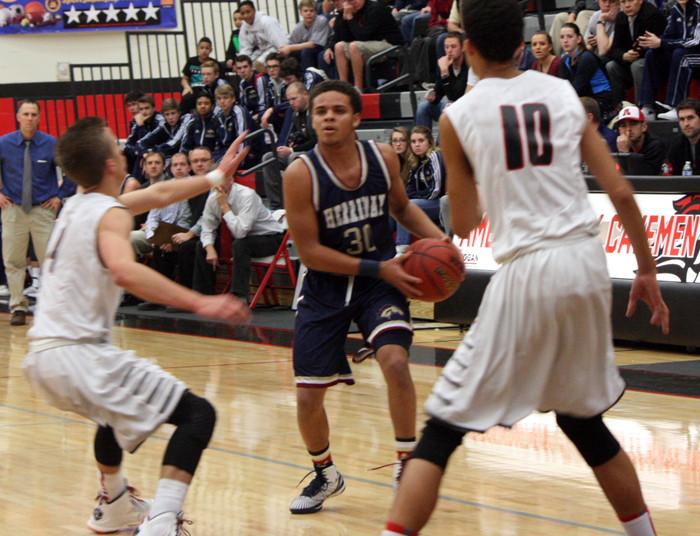 Maynard grabbed nine rebounds to go with a game-high 33 points to lead Herriman (2-2, 9-5), while 5-11 junior guard Jaden Vaughn also scored in double figures for the Mustangs, with 16 points. Junior center Jake Sutton and senior reserve forward Jordan Glauser made things difficult at the rim for the American Fork inside players, and Sutton finished with seven boards. The Cavemen, now in a three-way tie atop the region standings with Pleasant Grove and Lone Peak, are at Riverton (2-2, 10-5) Friday night as they try to get back on track. Herriman will try to keep a very talented Lehi (0-5, 9-7) team from getting its first league win when the Mustangs visit the Pioneers at 7 p.m. Friday.